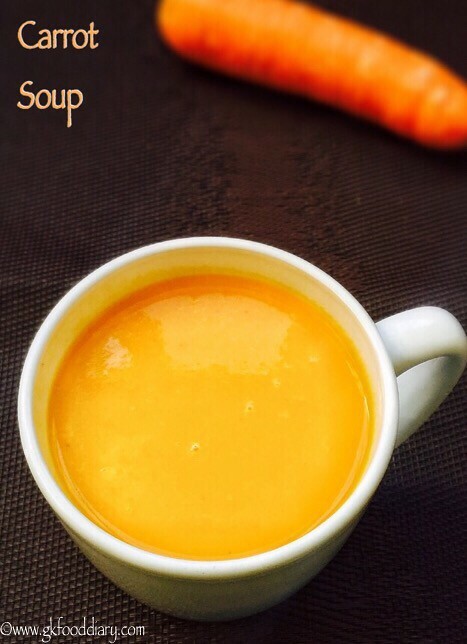 Carrot Soup – rich, creamy and healthy soup with carrots to warm your kids. Soups are comforting and effective foods during winters that helps fighting common cold and cough, improves digestion and boosts immunity! 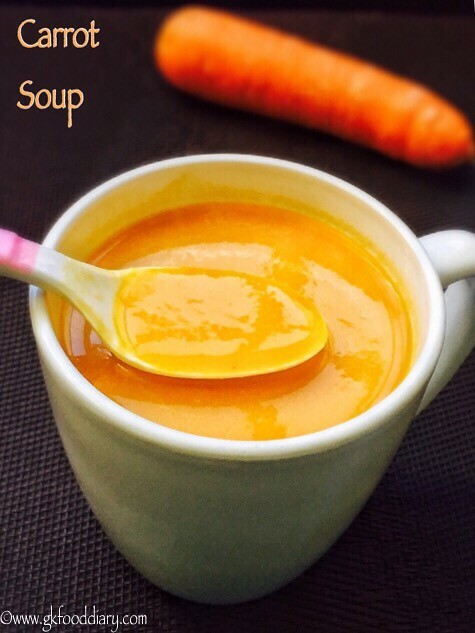 This tasty carrot soup with spices is best to opt if your baby is bored of plain carrot puree or your kid fussy about eating vegetables. 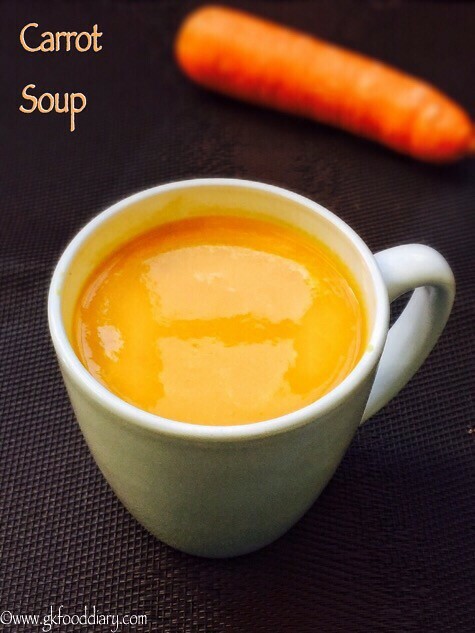 Carrot soup is ideal for babies from 8 months after introducing carrot separate. 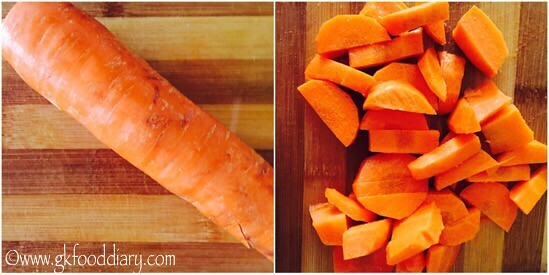 Now Let’s check how to make this easy carrot soup for babies, toddlers and kids. Wash carrots in running water well. Then peel the skin off from carrot with a peeler. Then chop them into equal size small cubes. Finely chop onions, ginger and garlic. Keep it ready. 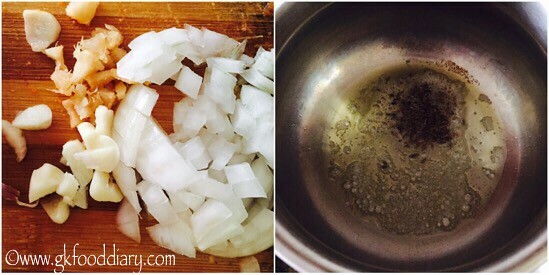 Heat a pressure cooker with a tsp of butter add cumin seeds. Let it crackle. Then add finely chopped onions, ginger and minced garlic. Stir it for 2 minutes. Then add chopped carrot pieces along with required salt & pepper powder. Add required water and bring it to a boil. Then pressure cook the everything together in medium flame for 3 whistles. Once the pressure is released open the cooker, the cooked carrots will be soft and transparent. 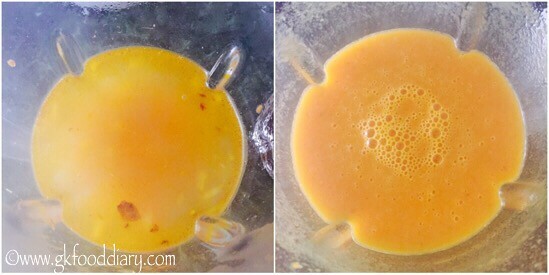 Transfer the cooked ingredients to a blender. Grind it to a smooth paste with the water used for pressure cooking. Strain the soup for small babies using a soup strainer and serve. Straining is an optional step. 1. Wash carrots in running water well. Then peel the skin off from carrot with a peeler. Then chop them into equal size small cubes. 2. Finely chop onions, ginger and garlic. Keep it ready. 3. Then add finely chopped onions, ginger and minced garlic. Stir it for 2 minutes. 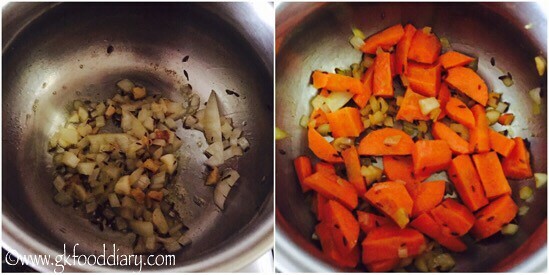 Then add chopped carrot pieces along with required salt & pepper powder. 4. Add required water and bring it to a boil. Then pressure cook the everything together in medium flame for 3 whistles. Once the pressure is released open the cooker, the cooked carrots will be soft and transparent. 5. Transfer the cooked ingredients to a blender. Grind it to a smooth paste with the water used for pressure cooking. 6. Strain the soup for small babies using a soup strainer and serve. Straining is an optional step. 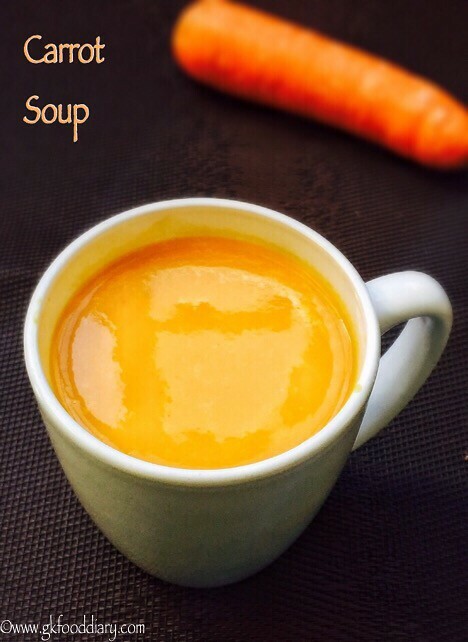 Healthy Carrot soup is ready. Serve warm! 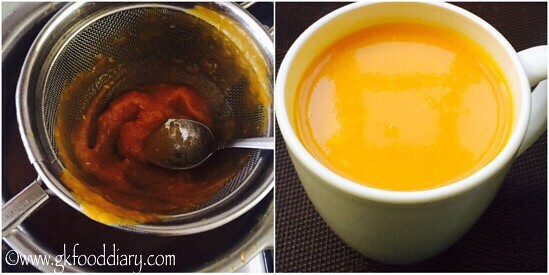 Introduce this carrot soup to your baby, after introducing carrot separate. Skip salt for babies below one year and make sure to strain the soup for small babies using a soup strainer before serving. For babies above one year you can add 1/4 cup of warm milk to the soup. It makes the carrot soup more filling and tasty. For toddlers and older kids (if they are interested in eating veggies as such), reserve some carrot pieces after pressure cooking and add it to the soup after blending. 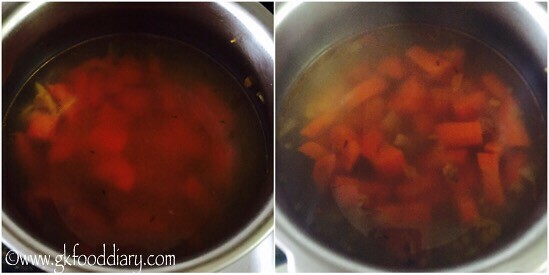 You can steam cook the carrots instead of pressure cooking. 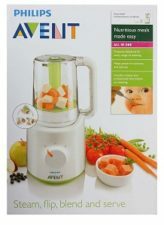 Prefer soups for babies below one year only when they are sick or on hunger strike. Thank yu for all the recipes. My baby has feeding issues and I need to trackof her calories intake. It would be nice if you could mention the calories in the recipes to help moms like me.